Lucknow metro has released notification for the recruitment of candidates as Assistant Manager and Account assistant etc. There are about 386 vacant positions for which the notification is released. There are many other positions included in the recruitment process. Candidates who are looking for the jobs can check all the required details from the article and apply online from the direct link provided below. Lucknow Metro is a rapid transit system serving the city of Lucknow in Uttar Pradesh.Construction of the line began on 27 September 2014 with the 8.5 km (5.3 mi) stretch from Transport Nagar to Charbagh Railway Station began its commercial operation on 5 September 2017 making it the fastest built Metro in the country. The Lucknow metro project is the most expensive transport system in Uttar Pradesh to date with an estimated total cost for Phase 1 and 2 of about $2 billion, of which ₹6,928 crore (US$1.1 billion) is being spent on phase 1. The Lucknow Metro Rail Corporation Limited, a 50:50 joint venture between the Government of India and the Government of Uttar Pradesh, was established to build and operate the metro. It conducts various examinations for the recruitment of eligible candidates in various departments. This year it has released notification for the JE/ SCTO/ Assistant Manager posts. Candidates should check the eligibility criteria like educational qualification, age limit, application fee, vacancy details, selection process, important dates etc. If candidates meet the eligibility criteria they can proceed further to apply online. Find all the required details or instructions mentioned in the notification or official website. Fill the application form without any mistakes and upload all the required documents. Candidates should go to the official notification and find more details regarding the recruitment regarding the Lucknow metro recruitment. Age limit will depend upon the post they are applying through this process. Candidates should have the minimum age of 21 and maximum of 28 Years. Age relaxation details can be seen in the notification. SC/ST candidates are required to pay a non – refundable fee of Rs 200/- for each post (exclusive of bank charges plus service tax). Candidates who applied for these posts will be selected based on the written exam and a personal interview. Then candidates will be placed in the vacant positions. 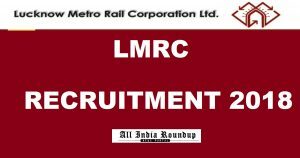 How to Apply For Lucknow Metro Recruitment 2018? Click on Lucknow Metro Recruitment. Stay tuned to this webpage for more details regarding the Lucknow Metro Recruitment 2018. Press CTRL+D to bookmark this page for more exciting updates.